When we talk about food security we often focus on the obvious: the availability, access, and utilization of enough nutritious food. We tend to hear less about the role literacy plays in supporting these pillars. But, as an organization focusing on a three prong-approach to reduce poverty through education, food security, and capacity building programs, Canadian Feed The Children (CFTC) knows the importance of tackling hunger and illiteracy simultaneously. Research has sh own that food secure children achieve higher levels of literacy, and children with higher levels of literacy lead more food secure lives. Millions of people in the world who are undernourished are also illiterate, and “the problems – and the solutions – […] are interlinked,” explained Lavinia Gasperini, Senior Officer at the Food and Agriculture Organization (FAO). According to the World Food Programme (WFP), 66 million primary school-age children attend class hungry across the developing world. This makes it much less likely they will successfully graduate, which in turn drives a very high rate of illiteracy (UNESCO estimates Africa’s literacy rate is less than 60 per cent). And because girls are much more disadvantaged throughout their school-age years, the problem of girls’ illiteracy carries into adulthood. Women make up two-thirds of all illiterate people and are more likely to face its correlated ill effects, including hunger. We can only address the cyclical and generational nature of poverty by addressing both illiteracy and hunger. How does hunger impact literacy? Hunger impacts literacy rates because children who grow up food insecure face many more challenges in achieving academic success. Shirley Estevez, CFTC’s Bolivia Country Representative emphasized: “Investing in early childhood and providing food security and the tools for a better education are key elements to break the cycle of poverty for vulnerable children.” Undernutrition in a child’s early years leads to many chronic diet-related conditions, including stunting, which is an irreversible reduced growth and development rate that negatively affects a child’s cognitive ability, school performance, and potential future earnings. Hunger has far-reaching consequences, and its impact on literacy and education goes beyond just the classroom: “One of the key reasons of child marriage in Africa is hunger. In most cases, these married children stop their education,” Sohel Khan, CFTC’s Senior Advisor, Food Security and Environmental Sustainability said. Desperate families are able to lessen the costs of feeding their family by organizing marriage for older children. Young child brides often become young mothers, which results in a continuation of the cycle of poverty and hunger into the next generation. How does literacy impact hunger? For example, literate wom en of child-bearing age are more likely than those who are illiterate to practice family planning. When women feel empowered to make decisions regarding the number of children they want to have, families are less likely to be forced to make decisions out of desperation. “Female literacy is [also] found to have an unambiguous and statistically significant reducing impact on under-five mortality […] which, in low-income countries, is mostly due to malnutrition,” the WFP states. Literacy also impacts agricultural productivity. 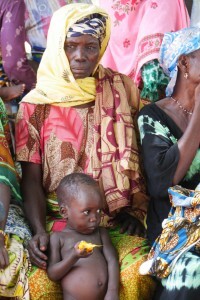 A 2006 WFP report outlined a study conducted by the World Bank that showed farmers who had been literate for two years had a greater understanding of nutrition, breastfeeding, and methods to improve crop production – including a 30 per cent increased likelihood to use fertilizer – than those who are illiterate. “Literate farmers can better learn improved farming practices, and have greater negotiating capacity in dealing with agriculture value chain actors like markets and buyers,” said Sohel Khan. 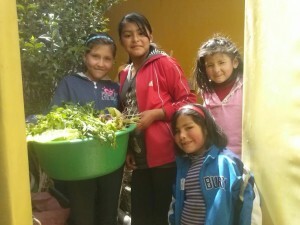 Canadian Feed The Children deliberately integrates food security and education programming in many of the communities in which we work, because by addressing both we are better positioned to help create sustainable change. CFTC supports hunger alleviation during the early childhood and school-age years through our school feeding programs in Canada, Bolivia and Africa. 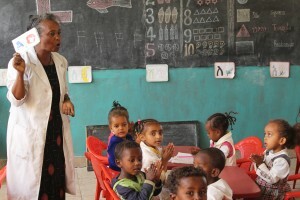 School feeding programs are encouraged by the FAO, WFP, among others, as a way to increase school attendance and concentration in the classroom, especially for girls. Our local partners report higher attendance rates, better academic outcomes, and lower child marriage rates because of CFTC supported school feeding programs. 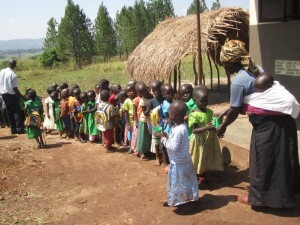 When a child’s education is sponsored through our child sponsorship program both hunger and illiteracy are addressed. The child receives the support and nutrition they need to succeed in school, allowing family resources to be reallocated, and guardians and the local community become empowered through resources and training on family nutrition, agriculture, and access to income generation activities. CFTC remove the barriers created by poor school infrastructure and lack of teaching and learning resources so that children have a better chance at staying in school and escaping poverty. By improving school infrastructure (like school latrines to encourage adolescent girl’s attendance), training teachers, and providing educational materials, we make sure that school environments are conducive to learning and literacy. By approaching poverty in the communities in which we work with a focus on both literacy and food security, we are able to give students the opportunity to be successful in school and graduate to more food-secure lives for themselves and their children.